HOW DID HE GET HERE? Graham committed to Texas last September — the day after the Longhorns’ season-opening win over Notre Dame — and he signed with Texas on Feb. 1. But in between there was plenty of recruiting drama. More than 20 schools offered him, and he was viewed as a possible flip after Charlie Strong left. But he never did, and was one of six recruits who pledged to Strong and signed with Tom Herman. Temple defensive lineman Taquon Graham competes during a 39-25 win over Round Rock on Sept. 2. Graham committed to the University of Texas on Monday (Henry Huey/Round Rock Leader). 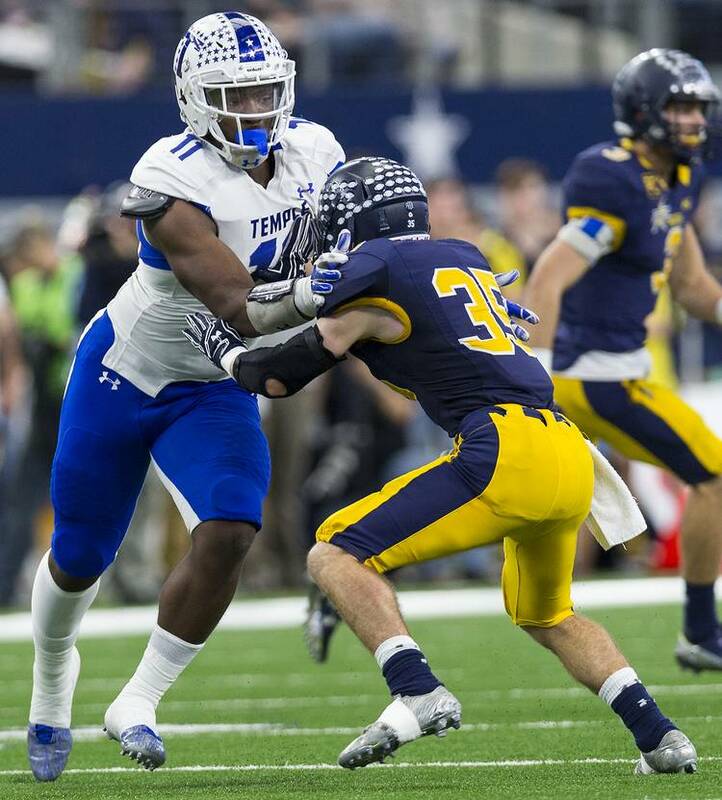 AT TEMPLE: A three-time all-district selection, Graham was one of only two defensive players in the state to earn district MVP honors in Class 5A his junior season. Played in two Division I state championship games and totaled more than 20 sacks in his final two years. WHAT HE’S WALKING INTO: At defensive end, Texas is in a position of both needing new bodies to supplement the roster but also wanting to nurture two promising players in Malcolm Roach and Breckyn Hager, who were disruptive presences in 2016. Graham’s history producing sacks is something the Longhorns are looking for. Graham said that his mother, Forestine Thompson, allowed his older brother to pick out his first name. Broderick Thompson, 31, also introduced Graham to the film room; he’d tape Ta’Quon’s youth-league games and then go over what was recorded. “I don’t want to say that I was a step ahead, but I was used to being criticized in what I was doing from a young age,” Graham said. Raised in Temple, Graham began playing football when he was six years old. He first lined up as a running back and cornerback, but a growth spurt forced him to move to tight end. He’s played on the defensive line since middle school. At Texas, Graham will be reunited with wide receiver Davion Curtis, who redshirted last season. Curtis and Graham were teammates at Temple in 2014 and 2015.